Well now, I’m on my way to Lafayette, California, to visit Gena Pardo. Yeah, those have been there a while huh? So where did you come up with this idea for glass doors? I've seen the look for quite a number of years in magazines that I worked in — that I used to work in. Now you realize that there's one problem with glass doors. I Have to be neat and clean. [LAUGHS] Yeah, I think you're right about that. So here's what I'm thinking — there are a couple ways we could do this. We could take these doors and cut holes in them and then drop glass in the center, which sounds like it might be easier. But the other way is to actually take the doors off and build brand new doors —frames and then put glass in the center. I think I'm going to opt for the second way. Okay. And why is that? Because it will be a bigger challenge for you. [LAUGHS] No, I think actually, it's going to be a little bit easier. All right, Gena. I'll use this to take those hinges off. 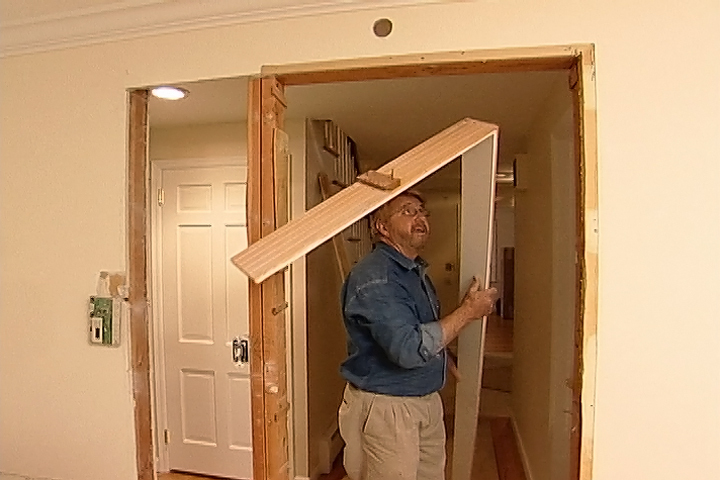 Gena and I begin by removing the old doors. Oh, I love that, how it sticks. The old doors will serve as templates for the new doors we're going to make. There we are, one down, four to go. Instead of being solid though, the new doors will be open frames, made from strips of 1 x 3 poplar we've purchased at the home improvement center. Step one is to cut these strips to length. That's — it looks a little scary but it's really a very, very safe saw to use. It's called a power miter saw. More correctly a sliding compound miter saw. It's got a lot of features on it. We're basically going to use it today just to cut the strips of wood to the proper length, okay? This is a nice feature of the saw. It's a work-stop and if you'll just slide this along here, you'll see that you can read different measurements as you go. So let's start with the sides. So we need eight pieces at 34 inches. So I set it right at 34. There you go. 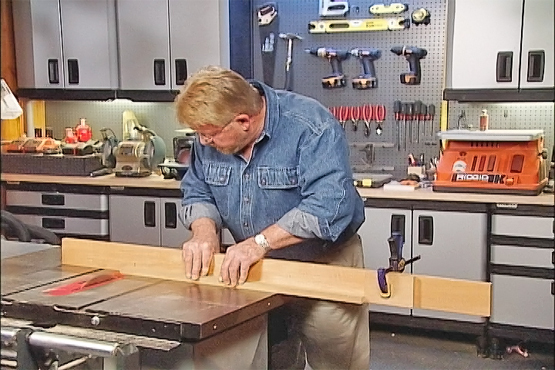 Using the power miter saw this way will insure that matching pieces will end up exactly the same length — essential if we want our doors to be square. Not bad huh, for your first cut? Wow. I think I'm better with this than I am with a screwdriver [LAUGHS]. So what we ended up with here are about — how many — 4, 16 pieces of wood, 4 for each door. We'll be joining these pieces at the corners, using something called a lap joint. At each end, we'll remove half the thickness of the board. When the two pieces are placed together at right angles, the ends will now overlap, forming a very strong joint. We'll remove the material from the ends using a router. Well, on both sides of that sort of cylinder, are two cutting bits. There's one right there and one, one right there. And so what we're going to do is, we're going to slide this along the end of these boards right here. We rout four ends at one time by clamping boards together on a flat surface. Now, Gena gives it a try. It's a little dusty, but after just a few passes with the router, she's got the hang of it. Now that we've formed the lap joints, we're ready to attach the framed pieces to each other. Right? 'Cause the first thing we're going to do on these is glue them together. 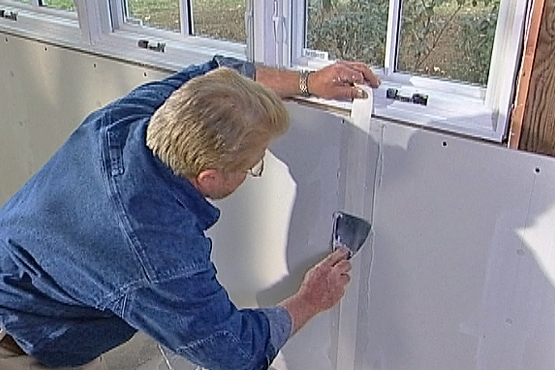 Putting the glue in a shallow can and applying it with a brush, makes it neater and insures an even coating. 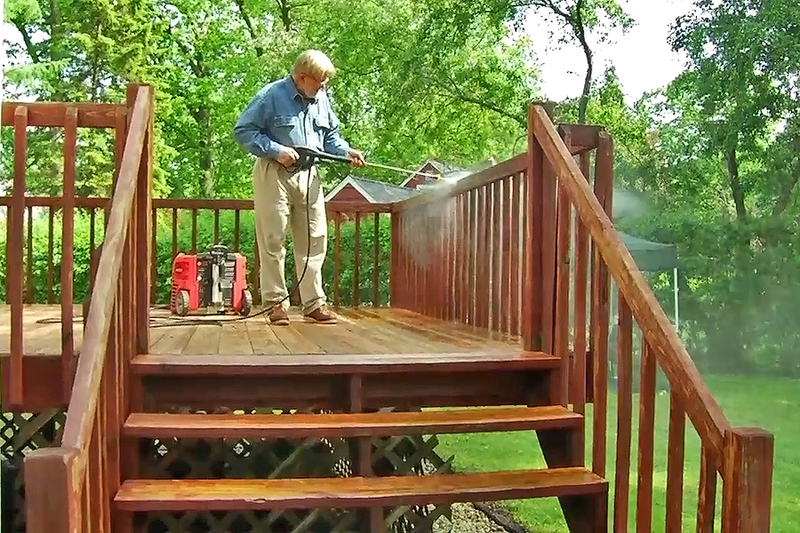 This is yellow wood glue and we apply it to both surfaces. We're going to place this one right on top of the other, just like that. Okay? And then I want to make sure that this is square so we'll put the framing square in here. Small nails or brads, will hold the joint together until the glue dries. Now, there's our first one. First frame, there are three more like this, huh? Okay, back to your favorite new tool, the router. This bit, called a roundover bit will remove the sharp corner from the edge of the frame, leaving a smooth curved surface. And since that has a ball bearing, the ball bearing will sort of guide itself around the inside here. Okay? So we've rounded over all these edges on the front of the door. Now I'm going to turn this over and we're going to do something to the back of the door. 'Cause these are going to be glass doors, so we have to create a little step into which the glass can sit. To do this, we switched to yet another router bit. This one is designed to cut rabbits or notches in the edge of the piece of wood. A ball bearing guide keeps the bit from cutting too deeply into the edge of the lumber. Because it is round, the rabbit bit leaves a small amount of material in the corners, which we remove with a chisel. The outside of the frame will also receive a rabbit, which will allow the door to set slightly inside the cabinet opening. Our frames are now assembled and machined to accept the glass. First though, we apply a coat of paint. It's much easier to do this now than after the glass is in place. As soon as the paint dries, in goes the glass. Now that we've got it in here, we've got to keep it in here. So we're going to use something called a keeper's strip. At least that's what I call it. A little strip of wood that's not painted here, and it just sits right in like that. And we're going to keep the wood in place with some of these very small brads. This is called a brad pusher. There's a magnet right there. I'm just going to put this in the end, okay. And then if you could kind of hold that in place, I'm just going to push the brad right into the wood. Four keeper strips, held in place with brads, will hold the glass securely in place. Well, the doors are finished. All we have to do now is install the hinges and hang them on the cabinets. I love these colors. They look great in here. Oh, this is just exactly what I wanted. I love 'em, absolutely the way I wanted it to come out. And was it fun actually building them yourself? It was fun. I'm going to have a great sense of accomplishment every time I look at it. It's terrific. Okay. Do me a favor? Charm your plain cabinet doors with DIY magic and the clean gleam of glass to brighten your kitchen d?r. No magic wand is required to pull these "rabbets" out of a hat--use a router and saw to construct the new frames of routed poplar with lap joints, decorative edges, and rabbets to support the glass inside the doors. 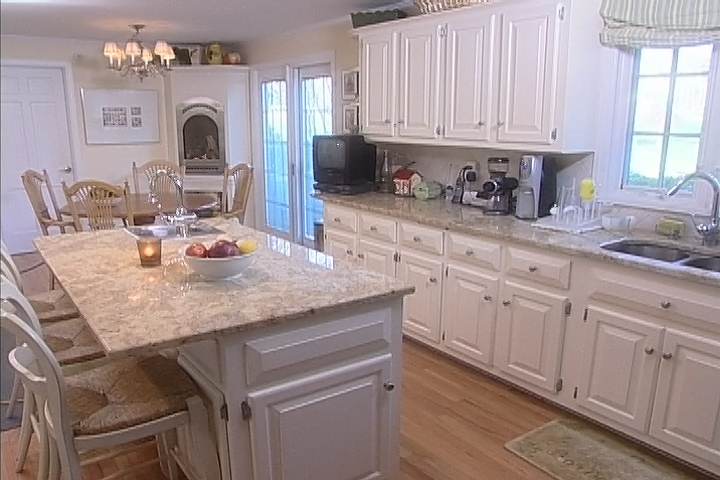 Remove plain painted cabinet doors and measure them for dimensions for new components. Set up a saw and work-stop to straight cut poplar stock to exact lengths. Four cabinet doors will require eight long pieces and eight short ones. Route ends of poplar components to make lap joints for each corner of the cabinet doors. Each of four doors frames requires four components with two routed ends, so routing four ends in a single pass saves time. 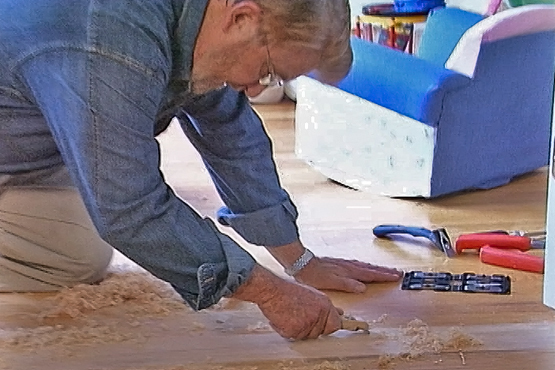 Apply yellow wood glue with a brush to both surfaces of the lap joints to attach frame pieces to each other. Use a pin nailer to drive in small brads and hold the joints in position until the glue dries. 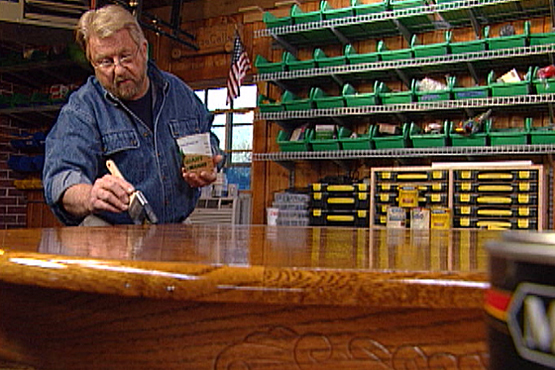 Use a round-over bit on the router to make smooth curved surfaces on the front edges of the assembled cabinet doors. The ball bearing on the bit will help control its cutting depth. On completion, turn the frame face down. Insert a rabbet bit in the hand-held router to create a step along the back inside edge of the door where the glass will sit. This bit also has a ball bearing to control the depth of the bit's cut. Use a hammer and wood chisel to remove the small amount of wood the rabbet bit leaves in the inside corners. 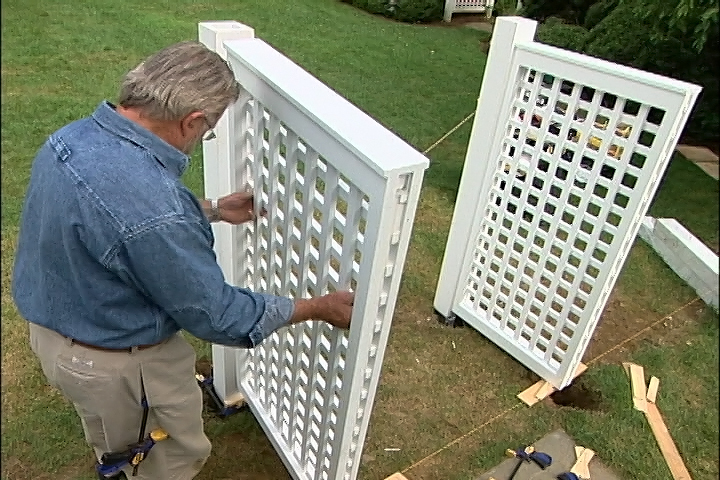 Square the corners neatly by making small vertical cuts on each side of the step and cutting the base. Route rabbets on the outer back edges of each door. These ledges and hinges let the back of the cabinet doors fit partly into the door opening in the base cabinets rather than just resting flat on top. Sand if necessary and apply primer and paint to the assembled and machined doors. It is far easier to paint them before mounting the doors to the cabinet bases. Insert glass into the back of each cabinet door. Cut and paint thin keeper strips to hold the glass in place, positioning them against the glass and securing them to the wooden door with small brads and a brad pusher. 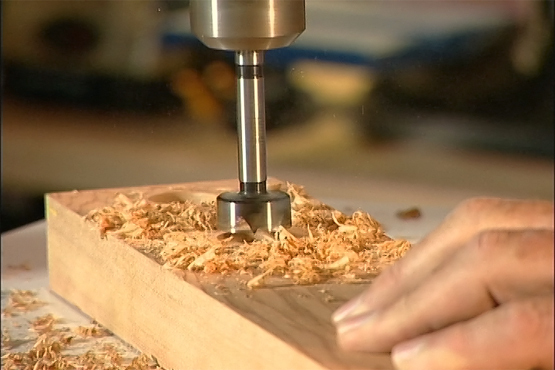 Use a self-centering countersunk bit on a power drill to pre-bore holes in the doors for their hinges. Position doors, insert screws in the hinges, and mount the new glass cabinet doors to the base cabinets.